Radiology is a completely image-based subject. According to recent official subject-wise marks distribution, Radiology forms a part of General Surgery which altogether constitutes 45 marks. You’ll find approximately 7-8 questions from Radiology in the coming exam. 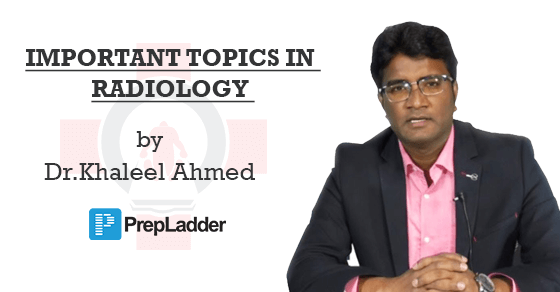 With a view to make your preparations more effective, we approached the famous faculty of Radiology, Dr. Khaleel Ahmed to guide you with the important topics from the NEET-PG perspective. Dr. Khaleel Ahmed has himself prepared the list of important topics which must be thoroughly prepared & revised before the exam. The app includes video lectures covering the entire Radiology, Tests with Video Discussion, Question Bank, Free daily updates and much more.